At the outset, please allow me to thank you all for your continued support during these uncertain times with respect to my health. You have no idea how much of a morale booster you all are and always manage to touch me deeply. Typically, the results from CT scans take about a week to be read and reports written and because I had three separate scans done on the same day, I'm hoping to hear something by Friday of this week or early next week. It's the waiting that's the difficult part and I've been trying to keep myself busy in the interim. This morning Debra (no blog), Darlene (of Darlene's mystery quilt fame) and I got together at Debra's to sew. Debra is a paramedic and Darlene works for a bank and both were on one of their scheduled days off. From now until Thanksgiving, Debra runs a shop out of her home where she sells the quilts that she has made over the winter months so when she's not at her "real" job, she is kinda house bound while the shop is open. I've been sewing with her about twice a week while she's been minding the shop. Let me take you on a tour. Debra's house is located right on a well-travelled lighthouse route, especially during tourist season. Her quilt shop is located in the garage right at the front of their house and is easily visible from the road. 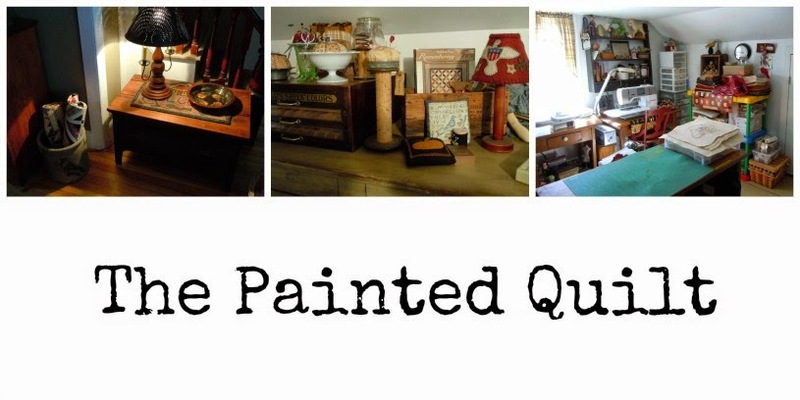 She has over forty quilts for sale in her shop with new ones being added all the time. There are styles and colors to please even the most discerning customer. She took another custom order for her Garden Gateway pictured on the bed below just yesterday. I think this must be what quilter's heaven looks like...don't you agree? Today, Darlene joined us as we sat around the kitchen table and worked like busy beavers, laughing and having a great time all the while. 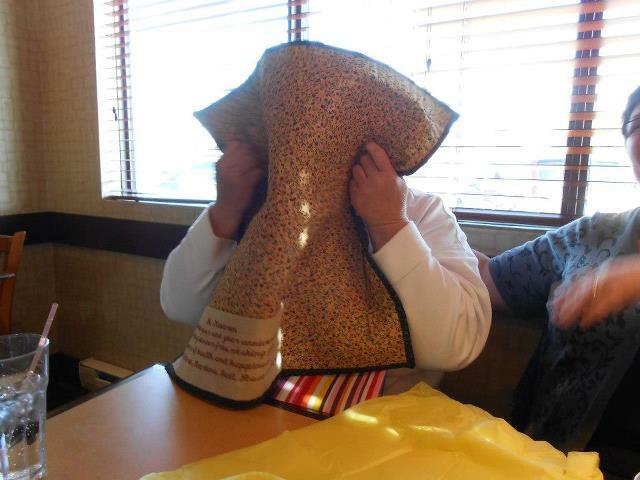 Here's Darlene busily working on a new project that she just designed. And here's Debra with her red and white Irish chain that was dropped off by the hand quilter while we were there. Since we moved to Nova Scotia two and a half years ago and because we live so close to the sea, one can't help but be influenced by the beauty that surrounds us...specifically the lighthouses, fishing boats, schooners and sea-faring memorabilia. Just recently, I designed a nautical-themed quilt and Debra and I have been spending time working together on our individual versions while testing the pattern at the same time. Debra finished machine appliquéing her main blocks this afternoon while I was still plugging away on one of the pieced borders. Although far from being finished, here's a little glimpse of Debra's version of my yet-to-be-named design. I'm hoping to have my top finished in the next week or so after which time it will be sent out to be quilted. Hopefully the actual pattern will be available for purchase in my ETSY shop in about six weeks. Will you help me with the naming of this quilt? I will give a free pattern to the person who suggests the winning title. So what do you think? Can you suggest a suitable name? Mr. Painted Quilt, Ollie and I will be leaving shortly to make the seventy mile trip up the Valley to the hospital where I'll be undergoing a complete body CT scan around noon today. Your thoughts and prayers would be welcomed at this time considering the findings from the bone scan that I had a few weeks ago had some questionable results. Whenever I find myself uptight, nervous or irritated, a quick tour of my gardens always seems to settle me down. So while dodging raindrops, I quickly managed to snap these photos just a few minutes ago. Because we've had an unseasonably cold Spring, most of the Spring blooming perennials and bulbs have been late to awaken from their Winter sleep. It has taken three years but the climbing hydrangea pictured above is finally going to bloom this year. It is filling out quite nicely and we're training it to climb up the bird feeder pole. Just looking at the photos leaves me calm and I'm ready to confront whatever challenges await me today. 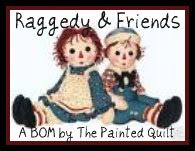 Quilting Friends are the Best! On Monday evening, five of my best-est quilting friends and I got together for what I thought was going to be a casual, girls-night-out dinner. Well it was that...and M-O-R-E! I was the last one to arrive, not because I was late but because...as I was soon to find out...they had a surprise for me. Just recently, I celebrated my one year anniversary of being cancer-free. Not a huge milestone, but a significant one nevertheless. Both Darlene and Gail...two of the gals in our quilting sisterhood...are also cancer survivors and can relate as to how each and every day is truly a gift after fighting the disease. And speaking of gifts, this is what was presented to me at our dinner gathering. I was caught totally off guard. When I realized what it was and it's significance, the tears just started to flow, not only because of the sentiment attached to the quilt but because of the thought and effort that went into making it. Here is my initial reaction...caught on camera. It's a good thing there's no sound. All the blocks are individually signed by my friends. Can you imagine my reaction when I saw the label on the back of the quilt? If you guessed that I lost it again, you guessed right. Darlene's Mom hand quilted it which made it even more special. If there is any doubt in your mind that quilting and blogging friends are the best, doubt no more. My deepest and most heartfelt thanks once again to Darlene, Debra, Gail, Rose and Nora. You gals are the best...and I am blessed and honored to have you as friends. Another week has flown by and when this happens, it usually means that I've been busy...which I have been! Just yesterday, I finished making the 48 log cabin blocks required for the next step of Darlene's mystery quilt. Darlene posted detailed step-by-step instructions complete with photos of the way she makes her log cabin blocks on her blog which you can read about here. I've never made log cabin bocks this way but I can tell you that from here on in, this is the ONLY way I'll be making them! Now I just have to sew them together and attach them to my flimsy which is growing with each passing month. Here it is hanging and waiting ever so patiently on the back of the door in my studio. One of our NSLQS (not-so-local quilt shops) is housed in the same building as a grocery store, gift shop and clothing store. When I went in there the other day, there was a box of hangers in the entrance marked "help yourself"...which I did...to six of them! I love these hangers to hang not only WIP's but also my mini quilts until I find a home for them. Here are a bunch of them which are now hanging on the other side of the same door. These hangers are the kind that don't leave marks and I find that hanging them is better than folding and stacking them which always results in fold lines. After a cold and wet Spring, who would have thought that we would be wishing for rain. We've had three weeks of beautiful sunny weather but that also means that we've had no rain either during that time. Brush fires have been imminent nearby and that is not a good thing. Thankfully there is a nice steady rain falling this morning and Ollie and Frankie have dozed off while listening to the pitter patter of raindrops on the roof. I don't know about you but one of my least favorite things to do is to fill bobbins. My friend Diane (no blog) told me about some 100% cotton pre-wound bobbins that she ordered from Superior Threads. They were recommended to her by the gal who does her longarm machine quilting and she loves them. I knew that there were pre-wound bobbins with polyester thread but wasn't aware that cotton ones were available. Since I only use 100% cotton thread in all my quilts, I decided to give them a try. I was a little concerned that they wouldn't be suitable for my Bernina but they work like a charm and I'm thrilled with the quality. There are two series available, the "L" and the "M" and you just have to check to see which is the one suitable for your brand of machine. I use a lot of ecru thread when piecing so that's the color I decided to go with although they are available in a multitude of colors. Here's the link to Superior Threads if you'd like to check them out. I'll definitely be reordering more when these are almost gone. Yesterday I was invited to attend a trunk show hosted by La Guilde Acadienne de Clare, a quilt guild located on the French shore of Nova Scotia, about 60 miles from where we live. Joan Tufts, President of the guild and I met yesterday and exchanged hugs for the first time. Joan has written a great post about it here. While there, I purchased some 100% wool batting which is my absolute fave! I'm hoping that if I whine loud enough, one of our NSLQS will order it in. I'm going to be using some of it while putting the finishing touches on June's First Friday Freebie, along with the flying geese pictured below. Edit: Judging from some of the comments that were left on this post and from emails that I have received, for those of you who might be new to my blog, I publish a free design/pattern on the First Friday of March, June, September and December. These are what I refer to as my First Friday Freebies. There is a link to all of them that I have published to date on the right sidebar of my blog. The next one...which I made reference to above...will be released on June 7th, which is the First Friday of June. And last but not least, I'd like to share my recipe for the best-est, richest, tastiest and yummiest bread pudding ever! I had some leftover on-the-stale-side dinner rolls so I decided to make some this morning. and 45 minutes later after baking and adding the sauce. Preheat oven to 350F. Grease a 13" x 9" x 2" pan. Mix together sugar, eggs and milk. Add vanilla. Pour over cubed bread and let sit for 10 minutes. In another bowl, mix and crumble together brown sugar, butter, pecans and raisins. Sprinkle over top and bake for 35 - 45 minutes or until set. Remove from oven. Mix together sugar, butter, egg and vanilla in a saucepan over medium heat. Stir together until sugar dissolves. Add brandy or brandy extract and stir well. Pour sauce over pudding. Let set about 10 minutes. Serve warm or cold. Some marriages are made in heaven. Sadly, this one was not. 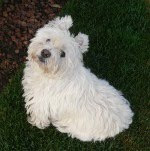 It grieves me to say that Husky Henrietta and I have parted ways with no chance of reconciliation. She has been returned to her original home and I'm hoping that her next relationship will be happier than ours was. I tried and I tried to fall in love with Henrietta but came to realize that even with all the bells and whistles, she and I kept on having issues that I could not get used to nor did I feel that I should have to with this caliber of machine. I have always been a Bernina gal but never realized how wonderful a machine they are until I actually tried to sew with something else. I was not prepared to compromise features that I took for granted with my fifteen year old machine and settle for something that would not only slow down my sewing but add "unnecessary" steps to perform what I deemed as simple, ordinary tasks on my Bernina. Please don't think that I am dissing Husqvarna machines because that is not my intention. I think that if one learned to sew on a Husqvarna...or any machine for that matter...then that would be their groundwork for a perfect marriage. I learned to sew on a Bernina and have since learned to appreciate that their product is exceptional. The shop where I purchased Henrietta gave me a full refund because they knew that I was not satisfied with it and witnessed the issues I was having with the machine first hand when I went for follow up classes at their shop. And now for the good news. On Wednesday when I went for my bone scan (no results as yet), we had three hours to kill from the time they gave me the dye injection until the actual scan time so Mr. Painted Quilt asked me if I would like to go to the Bernina dealer to check out their machines. 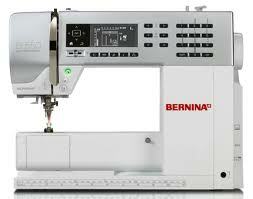 This baby...a Bernina 550QE...will be coming home with me in two weeks or less. The shop where we purchased it has to order one in and I was told that it would take that long because it has to be shipped from the Bernina warehouse. I would wait even longer if I had to because this is really my dream machine and I'm thrilled to bits. I'll still use my Bernina 1080QE for my grunt-work sewing and to lug to and from guild meetings and sewing get togethers because there's not a thing wrong with it. It has never been serviced and works as well today as the day I bought it back in 1997. Hopefully this will be my one-and-only-ever divorce because it was not a pleasant experience. 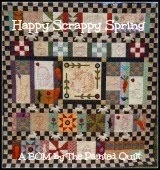 It's May 1st so that means that the second instalment or Row 2 of my Happy Scrappy Spring BOM is available for you to download. Woo hoo! Did you have enough time to finish Row 1? If you did, I'd love to see it! You can upload it to my Flickr Gallery which you can access on the right sidebar of my blog about half way down the page for everyone to admire. Here are the three photos that make up Row 2. I think you'll find that this row will come together very quickly. Enjoy yourself and have fun while you work your way through it. I had x-rays done yesterday and I'll be leaving in a few minutes to head about 60 miles up the Valley to the hospital for a bone scan. Wish me luck and you know that your thoughts and prayers always fill my heart with gratitude.